Wednesday Night 26th Anniversary Bush Dance - 8pm 31 July - The regular Wednesday night bush dance becomes a party! $3 for adults, includes supper. Bush Ball - 7.30pm Saturday 3 August, Albion Park Centenary Hall. All dances called and walked through. Adults $10, Youth (12-17) $5, children (U12) free. Concert and Social - Sunday 4 August, Mount Kembla Hotel, 2-5pm. Free entry. The name Wongawilli has certainly turned heads over the past 26 years, especially in Scotland! But in the main it has become synonymous with a bunch of people in the Illawarra region of New South Wales, performing, preserving and promoting Australian folk music and dance. The Wongawilli (Bush) Band and Wongawilli Colonial Dancers are part of the non-profit association Wongawilli Colonial Dance Club Inc. and this coming August will celebrate 26 years of doing so with a Concert, Bush Ball and Recovery Picnic over the weekend of 2-4 August 2013. The concert will be held on Friday 2 August at City Diggers Wollongong as part of the Illawarra Folk Club series and will feature a number of past members of the band. The relationship between the Illawarra Folk Club (Folk Festival) and Wongawilli Colonial Dance Club has been a very close one over the years. A recovery concert and social is then planned on Sunday 4 August at the Mount Kembla Hotel. The Club still presents a weekly bush dance at the hall. This dance was initially established in Dapto in 1985 and has been led musically by David De Santi since that time. The band, dancers and Club can easily claim to have revived the popularity of Australian folk songs, tunes and dances over its history in a major way. The work begun by the collectors of Australian folk songs in the 1950s has been continued with over 15 publications and recordings produced by the Club. In addition the Club has presented many events to further the awareness and enjoyment of this heritage. Such events as Collected Music Weekends, Bush Music by the Seaside, Colonial Balls and 7 Australian Folk Festivals paved the way for the resurgence of traditional Australian music and dance. The Wongawilli Band has made its mark with 7 recordings, with over 20 appearances at the National Folk Festival and travelling around the world presenting its authentic take on traditional Australian folk music. And now back to the beginning. The 1st August 1987 marked the first formal outing of the Wongawilli Bush Band at a bush dance at the Kiama Showground Pavilion. There were hundreds there! The band formed part of the newly created Wongawilli Colonial Dance Club along with the Wongawilli Colonial Dancers. 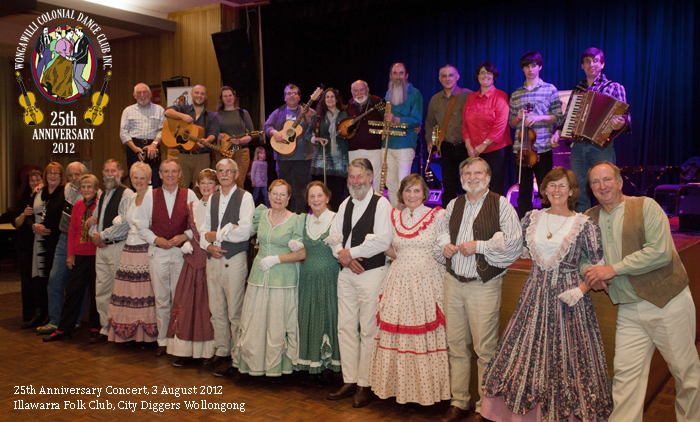 The basic aim of the Club was to promote, preserve and perform the rich tradition of Australian folk music, song and dance developed from the European settlers. The name Wongawilli had been selected due to its Aboriginal origins, a link to the Illawarra region and the fact that the Club was basing its activities at the Wongawilli (village) Community Hall, west of Dapto. Band members on that occasion included David De Santi, Tania Brownlee, Jane Brownlee, John Harpley, Tom McMahon, Charlie Cugaly, Harry Bronneburg, John Poulton and Dave Gill. The band had been formed from a collective of musicians who had been playing at sessions and a regular bush dance at the old Heinenger Hall in Dapto led by a very young David De Santi. The Wongawilli Colonial Dancers had also been formed from regulars at that bush dance to present Australian folk dances in costume. A WEA course in early 1987 provided a whole bunch of new and enthusiastic dancers. The year 1988 became very busy for the band and dancers with over 60 engagements celebrating Australia's bicentenary including its first appearance at National Folk Festival (Sutherland). Other members during that early period included Neil McCann, John Spillane and Tony McGloin. In 1990 Graeme Murray joined the band and a short time later Reg Murray, his father also joined. The band of David and Tania De Santi, Graeme and Reg Murray, John Harpley and Neil McCann settled into producing recordings, the first being After the Tradition in 1991 and travelling around Australia performing. John Spillane appeared with the band on a number of occasions as well. During that early period the band was fortunate enough to have contact with folklore collectors such as John Meredith, Rob Willis, Alan Scott, Brad Tate, Shirley Andrews, Alan Scott and Peter Ellis and realised that there were many more tunes, songs and dances out there to perform and give new life to. These collectors were more than happy to share their findings and to see them performed. So the band embarked on a mission to revive these old songs, poems, tunes and to actually get involved in the transcription and dissemination of the music and dances. It seemed a bit surprising that there weren’t that many other musicians interested in finding new / old material to perform apart from organisations such as the Bush Music Club. This gave the band a great opportunity to be musically creative and to be distinctive in the material presented. "The Celtic influence was still strong in the 1980’s and formative bush bands (mine included) still used the tunes and songs of the second generation (1970’s) Bushwackers. By this stage I had been travelling and collecting with John Meredith and we were playing some traditional tunes in our band ‘Blackridge’ which was based in Forbes so we did not have much influence. Besides this we put the band to bed in 1990 to concentrate on my collecting. This left the ‘Bush Bands’ of the day still playing the Waves of Tory and singing the Ryebuck Shearer, both at the speed of light. Merro and I just waited and started making these very rough demo tapes of tunes we had collected and handing them out to our mates. The salvation came in the form of one of these people a young bloke by the name of De Santi and his friends who had formed a musical group in the Illawarra and who had a passion for the traditional material. John Harpley had knowledge of the old songs, being raised in the bush at Eugowra and the others who had formed the core of the band Wongawilli shared this interest. The Murrays, Graeme with his great singing voice and the knowledgeable and talented Reg bought an aspect of traditional country music and musical experience. Neil McCann a brilliant songwriter and instrumentalist in his own right and of course (to me) the sound of Wongawilli was the subtle piano playing of Tania De Santi (or was it Brownlee then?). To me this recording changed the course of Australia’s concept of traditional music and song just as the original Bushwhackers had in the 1950’s. It brought to a wide audience the collected tunes and songs played in a manner that was representative of the era. This was complimented by the musicianship and vocal talents of these early Wongas." The Tunes of Bert Jamieson was released in 1992 and included the band playing to an original recording of Bert Jamieson on harmonica. Bert had been recorded by John Meredith and Rob Willis. Rob and Olya Willis also were part of the recording. The formula for reviving the old bush music received national recognition with 16 awards at the 1990, 1991, 1993 and 1994 Australian Bush Music Festival and Bush Band Championships. The band was awarded the following: Best Traditional Bush Band, 1990, 1991, 1992, 1993 & 1994, Best Instrumental, 1990, Best Contemporary Bush Band, 1991 & 1994. In the live section of the Australian Bush Band Championships the band was awarded the following: Best Traditional Bush Band, 1990 & 1992 and Best Bush Dance Band, 1990 & 1992. Graeme Murray received the 1991 Australian Bush Music Awards Best Male Vocalist ahead of John Williamson and Alan Scott. He repeated the award in 1993 and 1994. He shared the award in 1993 with Pat Drummond. David De Santi, along with Rob Willis of Forbes received the 1992 Australian Bush Music Heritage Award for their work in promoting and preserving Australian dance and music with the Pioneer Performers Series, a compilation of books and cassettes. In 1994 the band produced its second recording Australia Selection. The recording included a number of composed songs by Neil McCann and the ever popular And When They Dance. In 1998 a compilation recording of After the Tradition and Australian Selection was released in North America by Musica Pangaea called Australian Tradition. The year 1998 saw a major change for the band. Two of its long standing members John Harpley and Neil McCann decided to move on. The new youthful additions to the band were Jason and Chloe Roweth from Bathurst and the return of fiddler Jane Brownlee, Tania’s sister, from Sydney. A new recording was released in 1999 – Live at the Local, recorded at the Jamberoo Pub. Another highlight during that period was the presentation of a series of songs and tunes around Australian migration with BHP Youth Orchestra and SBS Youth Choir. The band also produced a double CD recording of music for Bush Dancing called Australian Traditional Dance Tunes. In 2006 the band changed once more with Jason and Chloe leaving for the 'bush' and Jane for London! The current band is Graeme and Reg Murray, David, Tania and Samuel De Santi, Miffy Ryan, Johnny Spillane and Tim Kendell. In 2009 the new version of the band released the recording Australia Street - a mix of collected tunes and songs and new; songs from songwriters such as Michael O'Rourke, John Broomhall and John Dengate exe mplifying the aim to keep the music fresh! The band, in various forms, has played in New Zealand, Denmark (4 occasions), Finland, Scotland, China (3 occasions), Sweden and Germany. During this whole period the Wongawilli Colonial Dancers have continued to perform to the live music of the band providing a unique performance. The routines are sequences of dances based on the various mainstream social dances from the bush and towns since the 1800s and dances introduced in the Folk Revival of the 1950s. So what has been the formula for the longevity of the Club, band and dancers? Maybe it's the fact that we've had fun and enjoyed the social aspect of music and dancing while contributing to our heritage.